Ogun state Governor Ibikunle Amosun today broke his silence on what he considered as the avalanches of rumours and falsehood being peddled against him by people bent on running him and his administration down. 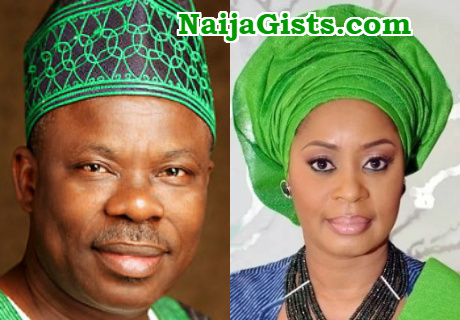 Amosun cited the case of a lady on National Youth Service Corps (NYSC) who was rumoured to have had twins for him in less than a year ago and said the rumour gained so much currency that his Mother – In-law had to call him to confirm if what she heard about a ‘second wife’ having twins was true or not. The Governor who debunked the rumour as “concoction of idiots” at the June 12 Cultural Centre, Abeokuta, the Ogun State capital, during a Town Hall meeting of stakeholders for the 2018 Budget preparation, said no lady or girl friend had twins for him. The meeting was organized by the state’s Ministry of Budget and Planning for the purpose of collecting the inputs of all stakeholders and build them into the preparation of the 2018 Executive Appropriation Bill but Amosun used the avenue to clear air on rumours being circulated against him. He said has been married to his wife, Mrs Olufunso Amosun, in the last 26 years and had never kept a girl friend, let alone having one that delivered twins for him, adding that the twins issue also got to the notice of his wife. He noted that task of keeping one wife is even challenging today in Nigeria and had no plans to double such challenges with additional baggage. The Governor also vowed to smoke out those peddling rumours and falsehood against him, saying he would send them to jail where they rightly belonged. She doesn’t have to know if he’s cheating on her, as long as he doesn’t give her STD. African men inherited cheating from their fathers, so it’s in their DNA. What you don’t know doesn’t hurt you. Why risk getting high blood pressure for a man? BEFORE NKO..FORMER MARRIED ALHAJI BAUCHI GOVERNOR WITH 4 WIVES, A SERVING SENATOR WAS CAUGHT RED HANDED PANTS DOWN WITH PROSTITUTES WHO VIDEO TAPED HIM AND HE WAS EVEN PROUD TO TELL US THAT HE WAS HELPING THEM FINANCIALLY.HE COULD HAVE BEEN FIRED FROM THE SENATE BUT IT WONT HAPPEN.MR GOVERNOR,TRY AND TELL THE MASSES THE TRUTH AND OE BETIDES YOU IF THE LADY HAVE ENOUGH EVIDENCE TO NAIL U.
Mr. Governor there is no smoke without fire. We are waiting. You can only fool yourself!